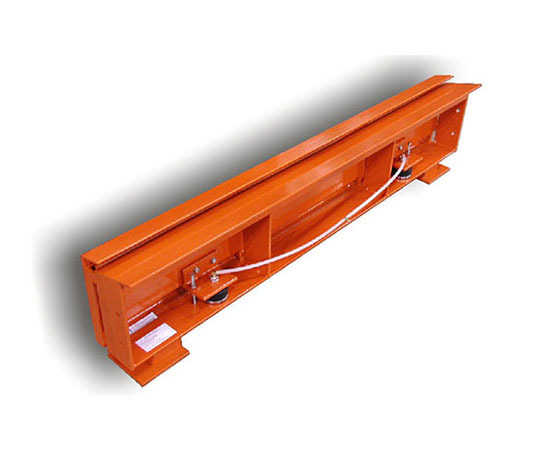 Systec's Sheet Gripper Device (SGD) is a very simple and effective design that allows deck sheets, or dunnage to be securely held in place while transferring a load across, onto the held sheets. Typical application for the SGD is at the end of a conveyor line, used in conjunction with a Sheet Pusher Device (SPD), Pusher Transfer Device (PTD), or Pop-up Infeed Device (PID) for load transfer onto the deck sheets. The SGD can also be used within a conveyor line for “straight-through” deck sheet loading and conveying. Wide and angled opening where the deck sheets are placed by the operator. The design lets the operator easily slip single wall, double wall, or multiple sheets into the device. Solid gripper plate, when pneumatically actuated, applies a tremendous force against the sheets assuring a full width, consistent grip.